Lord Downe Tankard & F Kirk Cup*. 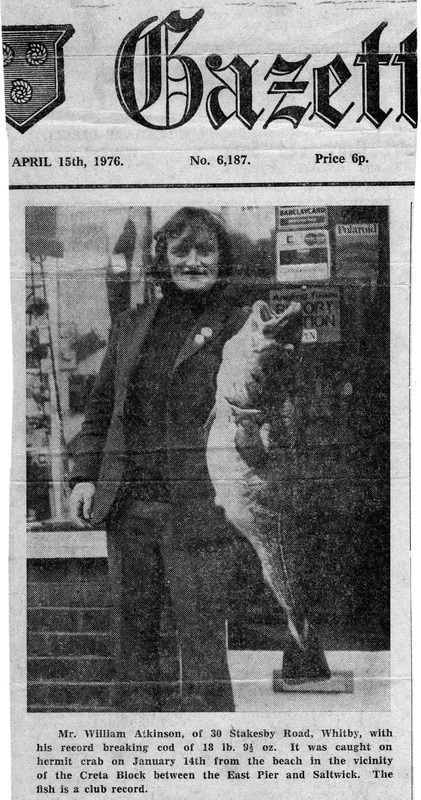 Heaviest Fish in a competition - W Atkinson - 18 lb 09½ oz - Wednesday 14th January 1976. Christmas match winner - W Atkinson - 17 lb 12 oz. Heaviest Bag of Fish - W Atkinson - 26 lb 12 oz - Wednesday 14th January 1976. 1st - S Howard - 24 lb 09 oz - Argyle Tankard & winnings of £2. 2nd - H Whorlton - lb oz. Total weight for the season - 767 lb 15 oz - 17 members. In Secretary, Dave Johnson's hand written notes for the 21st Annual Diner. Which would mean that the 1st Annual Diner would have been in 1956. *W Atkinson Heaviest Fish (new Club record) 18 lb 09½ oz - picture below. There is no mention of the Inter Club Trophy for this season. Total seasons weigh in 767 lb 15 oz - 17 members. 19 members fished this match - have to ask if this was the beginning for the WSAA Annual Open? 94 lb 09 oz Total weigh in. 28 members fished the match with £20 in prizes. Mr. William Atkinson, of 30, Stakesby Road, Whitby, with his record breaking cod of 18 lb 09½ oz. It was caught on hermit crab on Wednesday 14th January 1976 from the beach in the vicinity of the Creta Block between the East Pier and Saltwick. The fish is a club record. 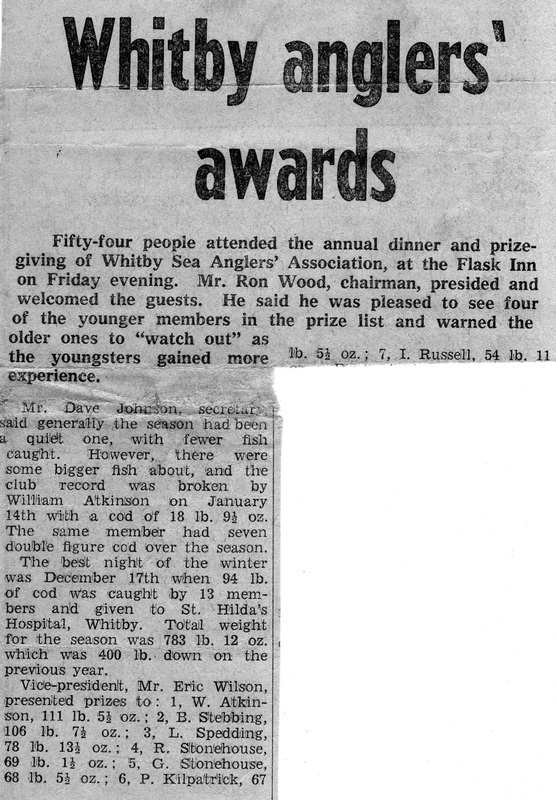 Courtesy of William Atkinson, Chairman of Whitby Sea Anglers Association, from his personal collection of press cuttings. Thanks also to the Whitby Gazette. Posted 18/02/2013 PDH. Fifty-four people attended the annual dinner and prize giving of Whitby Sea Anglers' Association, at the Flask Inn on Friday evening. Mr Ron Wood, chairman, presided and welcomed guests. He said he was pleased to see four of the younger members in the prize list and warned the older ones to "watch out" as the youngsters gained more experience. Mr Dave Johnson, secretary, said generally the season had been a quiet one, with fewer fish caught. However, there were some bigger fish about, and the club record was broken by William Atkinson on January 14th with a cod of 18 lb 09½ oz. The same member had seven double figure cod over the season. The best night of the winter was December 17th when 94 lb of cod was caught by 13 members and given to St. Hilda's Hospital, Whitby. Total weight for the season was over 400 lb down on the previous year. 7 - I Russell - 54 lb 11 oz. William Atkinson 1st (personal records). October - 14 lb 09 oz. November - 1 lb 09 oz. December - 40 lb 04 oz. January - 46 lb 14½ oz. February - 2 lb 06 oz. March - 5 lb 11 oz. Total weigh-in 111 lb 05½ oz.